synergy that exists at the intersection of all three. Matt Hellauer (MBA/MPP 2017) and Taniel Chan (MBA/MPP 2017) are invested in understanding how social change can be driven through public-private partnerships. Being the tremendous multi-taskers they are, they’re also eager to help prospective students understand more about the joint degree program and have shared a few of the things they think you need to know about the HBS/HKS joint degree. 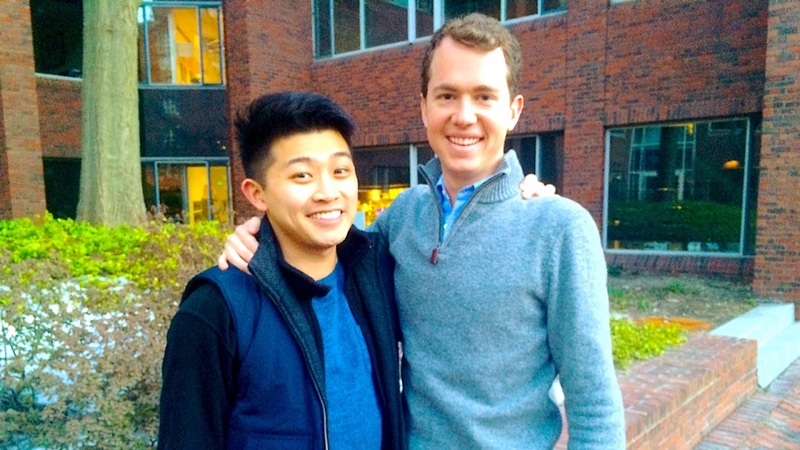 Taniel: Coming to HBS/HKS was an easy choice when I learned that my experience would not be bifurcated. Instead, it truly is one program with two degrees and you are officially a student of both schools from day one. You spend your first year at HKS, your second year at HBS, and your third year taking electives across both schools. Throughout your time here all joint degree students participate in a weekly joint degree seminar course – which is only available to students pursuing both of their degrees at Harvard. Many joint degree students find themselves getting heavily involved in activities and events at both schools across all three years. Matt: After interacting with students and faculty in my admissions process, choosing the HBS/HKS joint degree was an easy choice. The joint degree community is incredibly strong and everyone here is very passionate about making significant positive change in the world. Having the two campuses within a stone’s throw of each other creates a very integrated experience across both schools. The joint degree seminars, cross-class social events, and tight-knit joint degree cohorts all add to a very rich experience as members of both HBS and HKS. Taniel: I did not expect to get as close to the joint degree family as quickly as I did. We had the unique opportunity to go on a retreat for a weekend in Cape Cod before classes started and this getaway truly catalyzed what have been, and will continue to be, amazing friendships for years to come. My jointee cohort serves as a forum for both professional and personal guidance. Not only that, we go on an annual retreat where jointees from all three years attend. There is tremendous support from second and third year jointees and even jointee alumni who are eager to help us all succeed. Matt: I had heard anecdotally about the tight-knit joint degree community, but experiencing it is something completely different. I have never gotten so close with a group of people in such a short amount of time. Although we all come from incredibly different backgrounds, we all share similar career aspirations of doing a lot of good in the world by having a deep understanding of the public, private and non-profit sectors. These shared world views along with everyone’s enthusiasm for being here creates a remarkable group dynamic. This has certainly been a highlight for me so far. Taniel: For someone like me who is relatively young and eager to test-drive different careers, the opportunity to do two internships (or more for those who are ambitious and squeeze more than one in a summer) was a huge draw. I view my two summers as a unique chance to test different levers such as industry, sector, geography, and function. Matt: I am increasingly convinced that today’s leaders must have a thorough understanding of how the public, private and non-profit sectors interact with each other. The HBS/HKS joint degree program provides you with the curriculum, peer group, network and resources to accelerate attaining this knowledge. Taniel: Before coming to HBS/HKS I wish I knew more about the vast amount of funding opportunities jointees receive from both schools for summers spent working in non-profit organizations, the government, or social driven organization or even for educational treks abroad. I was initially concerned that financing such unique opportunities would prove challenging but I’ve been pleasantly surprised by how committed the two institutions are at reducing the challenge that money, or lack thereof, may pose for some individuals. The institutions implore us to be bold and may fund exciting projects or research opportunities you may have as long as you are passionate about them. Matt: Each day here is jam packed. You hear a lot of people outside the community say that “graduate school is a 2-3 year vacation.” My response to them is they clearly haven’t been part of the HBS/HKS joint degree program. Whether it is managing a heavy course load or listening to a world leader in the HKS Forum or attending meetings for my student groups or grabbing dinner with friends in Harvard Square, there is always something going on. Taniel: Give yourself a few months to really pour over the essay questions and find the anecdotes and experiences in your life that you think will allow you to portray your most authentic self. Consult with family, close friends, and colleagues – those who know you best - to collect their insight on how they view you and whether your narrative sounds true to who you are. Start brainstorming about potential recommenders and continue to develop your rapport with them because their support can go a long way in polishing your application. Matt: Start early! The HBS and HKS application processes require immense reflection on where you’ve been, where you want to go, and why you need these three years to propel your career forward. These are big questions and the answers can’t be rushed. The best thing you can do is to get the GMAT/GREs out of the way early and spend a lot of time reflecting. You not only will have a better and more authentic application, but you’ll get to know yourself that much better. Taniel and Matt graduated from the joint degree program in May 2017. Taniel is returning to Bain & Company in London where he did his summer internship. In addition, he is on track to getting his co-authored thesis on artificial intelligence and national security published and will spend his summer before starting work learning French across Europe. Matt will be returning to Allen & Company in NYC where he worked before school. He will continue work with his thesis client, Forward Cities, by helping bring entrepreneurship to historically disenfranchised communities across the U.S. It is common for new graduates to initially pursue work in the private sector but many anticipate transitioning to the public sector at some point in the future.